This is a match-three game, which means that you need to switch places of adjacent balls to try and form groups of 3 or more adjacent identical pieces lying on the same line. In this case your playing board is a spider web and instead of having common columns and raws you have circles and radius lines. Some of the balls have letters on them. To pass a level you need to eliminate all balls with letters including them in the same color groups. Swap neighboring beads to make a line of 3 or more matching beads. Collect all letters from the web to make up a phrase so you can move onto the next level. 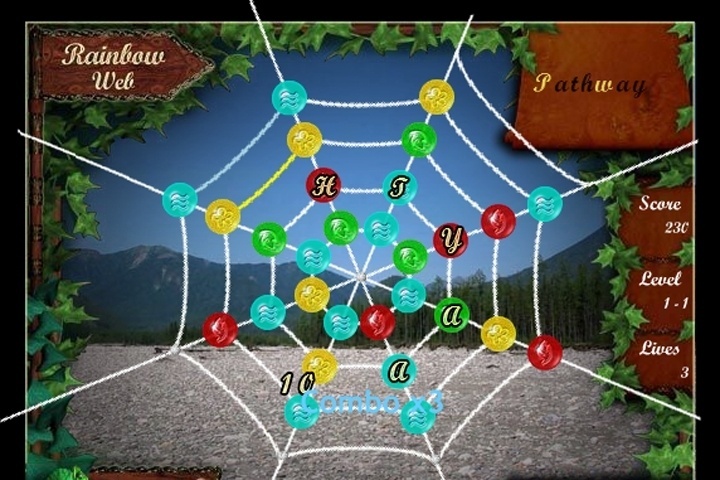 If you want to play Rainbow Web games online you have come to the right place! GamesLoon adds new Rainbow Web games every week. This is your game portal where you can find the biggest collection of free Rainbow Web games online. Do not forget to rate our Rainbow Web free online games while playing!